Limited - 30 days trial. free to try, $19.95 - to buy. 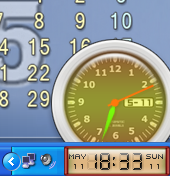 Can replace system tray clock with visual skins, show date and time together with different style skins. 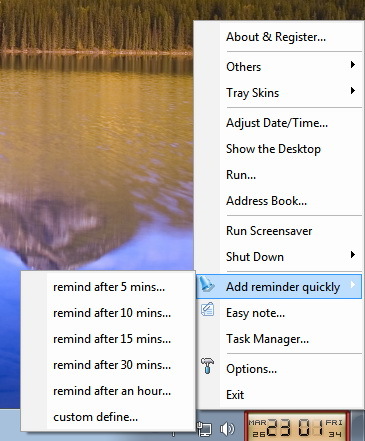 You can add reminder easily, Once or Recycle type. Fast to call todolist edit window to view and write down what you will do in future. Can define clock alarm sound and alarm at Quart? Half hour? One Hour? Beautiful, 3D looks, powerful functions, run with win2000/winxp/vista. Integrated Desktop clock with many changeable skins. 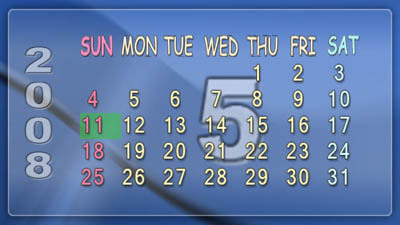 Integrated Calendar with many changeable skins. How to uninstall or remove TrayClockEx. ? To uninstall this software, you must exit TrayClockEx at first, then run uninstall program to remove it. How to change tray clock face with TrayClockEx ? You can fast to select tray clock face through menu, but it can not save as default. you can run options dialog to select tray clock face and save it as default. How to fast define alarm event ? Copyright (C) 2007-2010 pblSoft software, all rights reserved.